It is Saturday night-although a Saturday night long past and Worksops “Top Market” is in full swing. Some of the stalls are thronged. Others are not so busy. But at one there is a constantly ebbing crowd, people whose purchases will find their way into many homes as a special treat. As you may have guessed from this glimpse into the past the stall referred to was that from which Messrs. George Taylor of Marecroft Worksop sold their famous boiled sweets. Those days have been recalled to me by a member of the family, Mrs Norah Brailsford who used to assist both in the making of the confectionary and in it’s sale at the stall. “We never had a minute until we had sold out” “Our specialities were those famous black and white humbugs-those, I think, were the favourites-black butter scotch topped with almonds, mint or aniseed rocks, pear drops, and so on. We made them all ourselves in the boiling shops in Marecroft. The recipe was simple-sugar, mostly, and the various colourings and flavourings, and I have yet to find sweets any tastier or more wholesome. I was at the humbug and butterscotch end of the stall, and I served as many as fourteen full sized biscuit tins of sweets every market day. We had our regular customers, many with standing orders which might never change for years. Many people, particularly those from the country, bought for themselves and several neighbours. The confectionary trade was run in conjunction with the fruit and vegetable business carried on by Mrs Brailsfords uncles, Messrs. George Henry Brown Taylor and Walter BrownTaylor,( now deceased) and the manufacture of the sweets meant arduous hours in the boiling shops, where the same varieties were produced winter and summer. Mrs Brailsford, was as it were, brought up in the trade for as it was as a girl that she began to assist her grandparents in the work, and often, at busy times, she had to dash back to school without a meal. How would that go down with the authorities these days? And she still feels the effect of an accident in the boiling shops in which both her hands were badly burned when she plunged them into the boiling liquid. This had been poured into the vat unknown to her, and white like the inside of the vat itself was not easily visible. George (Carthorse )Taylor was my 3x Gt. Grandfather, he was called Carthorse Taylor because he ran along side a family member called Frederick Taylor whilst he was training, and George Taylor was likened to a carthorse in comparison to Frederick. His son George Henry Brown Taylor was nicknamed (Spicey Taylor) and was a very well known man in Worksop. 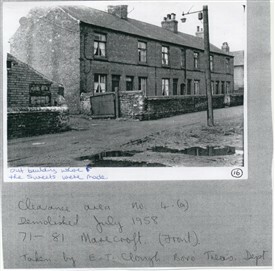 The row of houses were demolished July 1958, number 69-71 Marecroft is where the Taylor's lived. The out building next to number 71 is where the sweet were made. This page was added by Pat Malkin on 21/02/2011.